Tifinagh is a script used by the semi-nomadic Tuareg peoples of northwestern Africa to write their language, Tamashek. Inspired by neo-Punic, an African form of the Phoenician alphabet, Tifinagh is related to scripts that were employed for writing ancient Berber languages. In continuous use for more than 2,000 years, Tifinagh can be found in rock inscriptions throughout the Sahara Desert region, from southern Morocco and Algeria to Mali and Niger. Its distinctively geometric letters can be written from left to right, right to left, horizontally or vertically. Mothers often teach Tifinagh to their children, and both adult women and men use it. 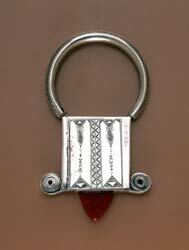 Some metalsmiths sign their names in the script, as seen on the Tuareg scabbard and pendants in this exhibition. The back of this Tuareg protective pendant, which is associated with healing and fertility, was signed in Tifinagh script. The inscriptions may be initials or a phrase: "It is I [name] who made this work." Back to What's in a Script?